The following article is disturbing because it implies that parents are simply too stupid to sort fact from fiction. The bright spot is that it shows that when the pro vaccine liars talk, some parents see right though the BS. This is exciting because it shows people are starting to raise concerns about the safety of vaccines. As the resistance to the vaccine lie, we have to step up our efforts to educate the masses about the dangers of vaccines and the very real benefits of natural immunity. We can do this but we have to step away from half truths and irrational fears of what other people will think or do. We can not control other people but we can move forward with truth, compassion, and a willingness to fight against the mass poisoning of humanity. 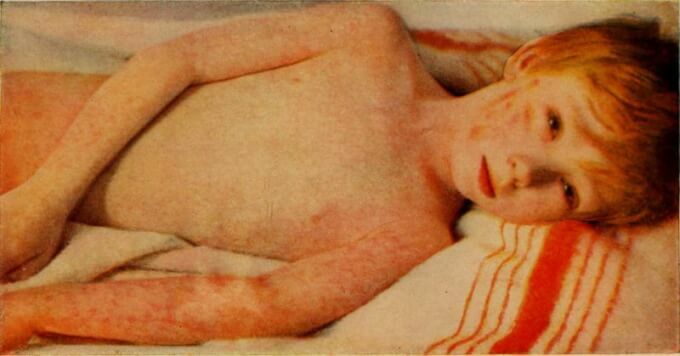 An example of a frightening image, in this case a child with measles, which may convince some that vaccines have frightening side effects. Striking at a myth with facts may only shore it up, a new study suggests. Researchers found that three main intervention strategies for combating anti-vaccine lies and falsehoods were ineffective at changing minds. But perhaps more concerning, they found that over-time exposure to the interventions strengthened participants’ belief in those lies and falsehoods, researchers recently reported in PLOS One. The researchers speculate that the mere repetition of a myth during the process of debunking may be enough to entrench the myth in a believer’s mind. “People tend to mistake repetition for truth, a phenomenon known as the ‘illusory truth’ effect,” the authors, led by Sara Pluviano at the University of Edinburgh, note. And when those myths are built into a framework of beliefs and world views—a cognitive consistency perspective—it becomes even harder to knock them out. The study is not the first to find that pro-vaccine strategies can backfire, but it picks apart how seemingly corrective information can be twisted in stubborn minds to support rather than refute misinformation. For the study, the researchers tested three common strategies on 120 participants to try to beat back vaccine misinformation: text that puts myths side by side with corrective facts; visuals and diagrams that convey the dangers of vaccine-preventable diseases and the real risks of those vaccines; and frightening images of children sick with the vaccine-preventable diseases. An example of myth-vs-fact information. Participants were randomly divided into four groups, three that got one of the three intervention leaflets listed above and a remaining group that got information about an unrelated topic, which acted as the control. The researchers surveyed participants’ vaccine opinions right before and after they got information, then seven days later. The surveys probed opinions on whether vaccines caused autism, whether vaccines had scary side-effects, and whether participants were hesitant about vaccines or getting them on a recommended schedule. Participants had a variety of opinions on the matter going into the study. But researchers monitored aggregate change within each group to assess and compare each intervention’s influence. Overall, none of the informational leaflets changed minds about vaccines initially. But things got worse after seven days. The group that saw the myth that vaccines cause autism side by side with facts refuting that myth were far more likely after seven days to believe the myth that vaccines cause autism. The group that saw frightening images of sick children were far more likely after seven days to think that vaccines cause scary, severe side-effects. Mean scores of the three key outcomes evaluated: Vaccines Cause Autism (A), Vaccines Side Effects (B), and Vaccine Hesitancy (C) by condition and time (after a week). Outcomes means at Time 1 are represented by blue bars, while outcome means at Time 2 by green bars. Error Bars: 95% CI. After seven days, the control group showed no change in their ‘vaccine hesitancy’ score. But all three groups that got informational packets on vaccines saw increases in their vaccine hesitancy scores. The study has limitations, of course; it’s small, tests mostly college-aged students, and is based on survey responses rather than actual vaccination rates. But the researchers say it’s still a useful example of how people can misremember information in their mind over time. As for what’s next, the researchers are at a bit of a loss. Certainly, they argue, more research is necessary to figure out how to demolish ingrained myths. For now, their advice to public health advocates and experts is to try a bombardment method—lots of interventions, together, and repeated—and hope some facts start to stick. PLOS One, 2017. DOI: 10.1371/journal.pone.0181640 (About DOIs). Measles 1950s Style! Listen & Learn!